Have you read a comic called Naruto? There, you can see about 5 elements, Earth, Water, Fire, Wind, and Lightning. But is that true? Well, let's see what Japanese culture have about the 5 elements. 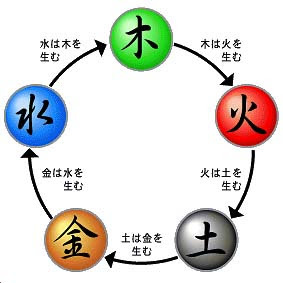 Japanese old tradition says that with these five elements, you can get a wonderful well-balanced life. You can find these elements in everything, and if you can get along with them, you will be able to have a long and happy life. 1. Chi. It means Earth. Represents the hard, solid objects of the world. Emotionally, Chi is predominantly associated with stubborness and stability. In the mind, it is confidence, and emotionally has a desire to have things remain as they are; a resistance to change. When under the influence of this chi mode or "mood", we are aware of our own physicality and sureness of action. 2. Sui or Mizu. It means Water, represents the fluid, flowing, formless things in the world. Outside of the obvious example of rivers and the like, plants are also categorized under sui, as they adapt to their environment, growing and changing according to the direction of the sun and the changing seasons. Blood and other bodily fluids are represented by Shui, as are mental or emotional tnedencies towards adaptation and change. Sui can be associated with emotion, defensiveness, adaptability, and flexibility. 3. Ka or Hi. It means Fire. Ka represents our metabolism and body hear, and in the mental and emotional realms, it represents drive and passion. Ka can be associated with motivation, desire, intention, and an outgoing spirit. Besides the obvious examples of heat and flame, lightning can also be thought of as an extension of Ka. 4. Fū or Kaze. It means Wind, represents things that grow, expand, and enjoy freedom of movement. Aside from air, smoke, and the like, fū can in some ways be best represented by the human mind. As we grow physically, we learn and expand mentally as well, in terms of our knowledge, our experiences, and our personalities. Fū represents breathing, and the internal processes associated with respiration. Mentally and emotionally, it represents an Open-minded attitude and carefree feeling. It can be associated with will, elusiveness, evasiveness, benevolence, compassion, and wisdom. 5. Kū, oftenly translated as Void, but also means Sky or Heaven. It represents those things beyond our everyday experience, particularly those things composed of pure energy. Bodily, Kū represents spirit, thought, and creative energy. It represents our ability to think and to communicate, as well as our creativity. It can also be associated with power, creativity, spontanity, and inventiveness. Kū is of particular importance as the highest of the elements. In martial arts, particularly in fictional tales where the fighting discipline is blended with magic or the occult, one often invokes the power of the Void to connect to the quintessential creative energy of the world. A warrior properly attuned to the Void can sense his surrounding and act without thinking, and without using his physical senses. Can real human do something like that too? Make a Fire out through his hand.. Riding wind, create and freeze water.. Make a stronghold from earth element..
Wow. But taichi and kungfu need a patience, and I want an air magic without learned something. Hahaha. I'm too busy (and lazy) to study how to control inner energy.